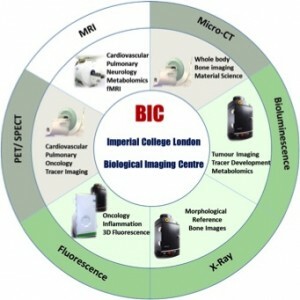 In 2015 the Department of Medicine launched the new Biological Imaging Centre (BIC) at the Hammersmith Campus. The centre is dedicated to high-quality imaging research in preclinical models of disease using PET/CT, MRI and optical imaging. Our goal is to translate discoveries from the bench, efficiently and confidently, to realise their potential to improve health. The centre houses a top of the range Bruker BioSpec 9.4T MRI system which allows high resolution in vivo imaging of all murine models of disease and therapy, from diffusion tensor imaging of brain connectivity, measures of tumour burden, through to live assessment of cardiac function and viability. The Inveon system is a versatile platform allowing Computed Tomography (CT), Single Photon Emission Computed Tomography (SPECT) and Positron Emission Tomography (PET) studies to be carried out on a single integrated gantry. In addition to our MRI and PET/CT capabilities we also provide two optical imaging systems. Fluorescence molecular tomography (FMT) is a novel tomographic near-infrared (NIR) imaging modality that enables 3D quantitative determination of fluorochrome distribution in tissues at any depth. The PerkinElmer IVIS Lumina XR III on the other hand provides an expandable, sensitive bench-top imaging system that is easy to use for both fluorescent and bioluminescent imaging in vivo. Led by Dr Lan Zhao, with a dedicated team of staff, the centre provides access to and support for scientists from across Imperial College to conduct research in a broad range of preclinical areas. If you are interested in preclinical imaging and would like to discuss potential projects please contact us at icbic@imperial.ac.uk. Further information about all of our modalities can be found on the Biological Imaging Centre website. Imperial College’s Centre for Engagement and Simulation Science (ICCESS) took their ‘Time-Travelling Operating Theatre’ project on the road in September and October 2015 to great acclaim. 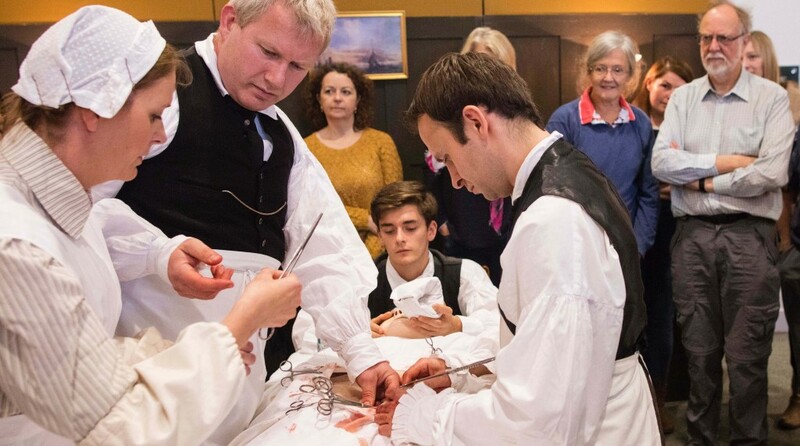 The project, funded by the Wellcome Trust, featured real clinicians working together in re-enactments of three eras of surgical history – 1884, 1984 and 2014. Members of the public were taken on a time-travelling journey through each era to see how technological, cultural, environmental and social changes have influenced the development of surgery. Led by Sharon-Marie Weldon, the ICCESS team delivered the events at a number of prestigious venues; the Science Museum and Royal College of Nursing in London, the Thackray Medical Museum in Leeds and finally the National Museum of Scotland in Edinburgh. The events were very popular with the public and attracted a diverse audience. The key aim of the project went beyond the delivery of the events, however. Research has shown that it is very difficult to engage the general public in debate that can shape healthcare policy. Each Time-Travelling Operating Theatre event was followed by a discussion amongst audience members, clinicians and others such as ethicists and medical defence lawyers. Some really interesting perspectives emerged from these discussions that covered a wide range of issues, from the ethics of modern medical procedures through to the environmental impact of the present-day healthcare system. 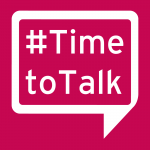 Sharon-Marie is currently analysing the data that was captured from these discussions and will be producing a paper that examines whether hands-on engagement activities such as this represent the future of ensuring public involvement in shaping the future of healthcare. It was an evening designed to inspire. This was a chance to celebrate the first five years of the CSC’s Suffrage Science scheme, which aims to encourage women into science, and to stay there. With Helen Pankhurst involved, it was also a chance to explore the role of activism today, and the changing nature of women’s activism since her great grandmother’s time as a Suffragette. 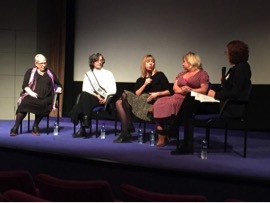 The evening, hosted by the Tricycle theatre in North London, began with a screening of Suffragette the film – to remember those who gave the Suffrage Science scheme its name. The film features Carey Mulligan, Helena Bonham Carter, Meryl Streep and others in a frank portrayal of the fight for Votes for Women. It was an uncomfortable watch. Historical details, such as the Cat and Mouse Act, rendered so much more powerful when portrayed in unflinching detail on the big screen. Before the film head of Communications and Public Engagement at the CSC Susan Watts, sat down with Helen, and talked about how her famous Pankhurst predecessors might view today’s activists; about who inspires her and about whether she sees signs of activism in science and medicine today. 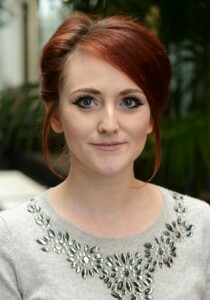 “I think the whole of science is about activism. It’s about looking at a particular discipline and pushing the boundaries of what that discipline can deliver – and often it’s about the relationship between science and humanity and what science can do in terms of changing the world that we humans live in. So to the extent that it enables society to benefit in a hundred ways, that is activism. Read the full write up and watch the interview. CSC scientists have also published their findings in several high profile papers this month. A study in Nature Cell Biology shows that we do not yet have the whole story about how fertilised eggs produce the many different types of cell that make up our adult bodies. It is widely accepted that an enzyme called Tet plays an important role, but something else seems to be at play, according to the study. Scientists including the CSC’s James Ware have found that women who suffer unexplained heart failure towards the ends of pregnancy or shortly after giving birth share certain genetic changes. The finding provides some explanation for this mysterious condition, and suggests that by testing relatives, other women who carry the same genes, and who might face similar risks, could be identified early. They could then be monitored closely and treated more swiftly if needed. In the future preventative treatment might be developed too. And a study published in Nature Communications is the first to show that an enzyme crucial to keeping our immune system healthy “surfs” along the strands of DNA inside our cells. “I am thrilled to have received a Prostate Cancer Foundation Young Investigator Award. This grant will allow me to vastly accelerate our promising research into the mechanisms through which prostate cancers continually evolve to develop resistance to even the most effective drugs – an area which remains poorly understood. In the future, this knowledge will help us to develop more effective therapeutics and tailor treatments to individual patients.” – Dr Claire Fletcher. Prostate cancer (PC) is the most prevalent malignancy of Western males, affecting 1 in 8 men in their lifetime. Relapse on first-line anti-androgen treatment occurs almost invariably, leading to advanced ‘castration-resistant PC (CRPC), metastasis and patient death. Next-generation therapeutics that target the androgen receptor (AR) or alternative oncogenic signalling pathways, alongside taxane-based chemotherapeutics, demonstrate efficacy in the CRPC setting. However, only 50% of men respond to taxane-based chemotherapy, and acquired resistance to novel AR-targetting agents is emerging due to intra-tumoral androgen production or AR amplification. This necessitates urgent identification of new therapeutics and drug targets for CRPC, and discovery of resistance-predicting biomarkers. MiRs are small 18-22nt RNAs that negatively regulate gene expression. They can function as ‘oncomiRs’ or tumour suppressors and show altered expression in CRPC. They are readily detectable in bodily fluids from patients, demonstrating considerable biomarker potential, and represent ideal therapeutics due to their small size, high stability and low toxicity. I have previously demonstrated that miRs dramatically alter AR activity, growth and metastatic potential in CRPC and that levels of putative oncomiRs are altered by novel CRPC drug treatment. Further, miRs are associated with chemotherapy resistance. This project will use small RNA sequencing and functional assays to identify miRs that play fundamental roles in development of resistance to mechanistically-distinct novel CRPC agents in clinically-relevant CRPC models, and will generate miR biomarker ‘signature’ arrays that can predict resistance to such therapeutics. This will inform clinical management of PC and avoid the considerable morbidity and toxicity of agents that may not benefit a given patient. Development of therapies targeting resistance-promoting miRs may provide an additional treatment option for CRPC patients, increasing disease survival. The Department of Surgery and Cancer is delighted that Michael Uren has been knighted in the Queens New Year’s honours list 2016. Michael received the honour in recognition of his philanthropic activities. Over the last 8 years, The Michael Uren Foundation has given an astonishing £100m to good causes, across a wide range of topics, many of them unheralded. His Foundation has been a staunch supporter of the MSk lab for almost a decade, but recently changed the course of Imperial by pledging £40m to support the creation of the Michael Uren Biomedical Engineering Hub at White City Campus. This 12 story building will allow Imperial to grow the next generation of engineers, scientists and medics in a purpose built environment where the lower floors house clinical intervention space, allowing devices to be designed, developed and trialed on site. 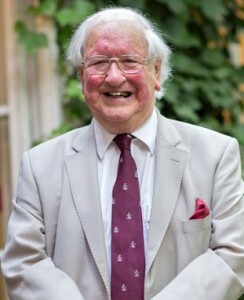 Sir Michael is a familiar face to many in the Department, and particularly in the MSk lab, having visited on several occasions to see the work his generous donations have supported. The Foundation’s gifts have played a vital role in helping us develop new areas of work, purchase cutting-edge equipment and build and sustain a talented, cross-disciplinary team of researchers. The flexibility afforded by these gifts has also been exceptionally important in allowing us to direct philanthropic resources into priority areas where corporate and research funding is not currently available. We look forward to welcoming Sir Michael on his next visit.